As depicted by an artist, Cik Siti Wan Kembang governed Kelantan between 1610 and 1667, and was known as a warrior princess. THE Malay world, while united by a common language, a collective commitment to Islam and a shared history, also preserves a variously expressed but mutually-held set of customary traditions (adat). Muslim scholars, both past and present, have long debated the Islamic legitimacy of adat. In reality, however, many adat practices complement the ideals of Islam — ideals often overlooked by more “orthodox” Muslim practitioners. This is particularly so regarding the treatment of women. A perception exists that Islam encourages the seclusion of women. While modern feminist readings of the Quran are celebrated for challenging this, it is worth noting that Malay adat has permitted Muslim women to attain public positions of power and influence for centuries. In wake of International Women’s Day 2019, this article celebrates five Southeast Asian “Queens of Islam”, beginning with two sisters from the region’s early Peranakan (Sino-Malay) community. During the late 1300s, the once great city of Palembang, former capital of Srivijaya, became a Chinese-led pirate base. In that guise, it wrought chaos throughout the Straits, disrupting trade and threatening regional peace until Zheng He, exasperated by the threat it posed to his fleets, attacked and conquered the city in 1407. Expelling all the city’s pirates, Zheng He appointed Chinese Muslim Shi Jinqing as its new ruler. Under Shi Jinqing, Palembang embraced Islam and re-engaged in international trade. After his death in c.1421, control of the city was divided between his two daughters, Shi Daniang and Shi Erjie. For more than 20 years, these two ruled the city justly, ensuring the maintenance of peace and the development of a flourishing economy. Subsequently, Shi Daniang also travelled to Java, where she became shahbandar (harbour master) of Gresik. With the title Niai Gedi Pinateh, she preached Islam throughout the island, becoming a pivotal figure in its Islamisation. She even adopted and educated Sunan Giri, the most prominent of the Wali Songo. Elsewhere in the region, the early 16th century saw Perak fall under the control of tribal chieftain, Tun Saban, and his sister, Tok Temong. In 1528, Tun Saban invited Muzaffar Shah, a descendant of Melaka’s final ruler, to become Perak’s first sultan. During Muzaffar Shah’s inauguration, Tok Temong presented him with Mestika Embun, a powerful talisman. She refused, however, to cede her territory; confident of her own authority, she reminded Muzaffar Shah that, while he may rule Tun Saban’s lands to the right of Sungai Perak, she ruled to the left. 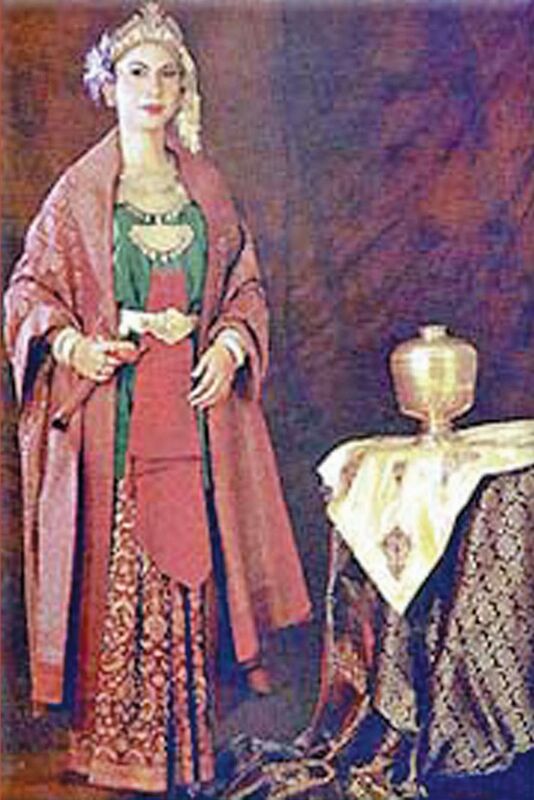 Although Tok Temong’s territory would ultimately pass to Muzaffar Shah upon her death, the latter refrained from challenging her authority throughout her lifetime, demonstrating the respect she commanded. Even today, Mestika Embun remains a crucial part of Perak’s royal regalia, without which royal authority cannot pass from one generation to the next. Until the reign of Sultan Idris Murshidul Azzam Shah (1887-1916), Perak’s royal graves and settlements were also exclusively located on the right side of Sungai Perak, out of respect for Tok Temong. Turning to 17th century Aceh, this staunchly Islamic and fabulously wealthy Southeast Asian kingdom was famously ruled by Sultan Iskandar Muda from 1607 to 1636. It is often forgotten, however, that Iskandar Muda was succeeded by his daughter, Sultanah Safiatuddin Syah (1641-75). While some have suggested that Sultanah Safiatuddin’s appointment was a ruse by Aceh’s powerful nobility to weaken royal authority, her ascension actually reflected the power of local matrilineal adat and the support of Nuruddin al-Raniri, Aceh’s shaykh al-Islam. In his Bustan al-Salatin, al-Raniri argued that Sultanah Safiatuddin possessed all the qualities necessary for leadership and should therefore be allowed to rule, just as local adat permitted. Even the Dutch supported this assessment, describing her as “good-natured but awe-inspiring”. Today, however, Sultanah Safiatuddin is poorly received by historians, who blame her for Aceh’s mid-17th century decline. But, while Aceh did lose most of its empire under Sultanah Safiatuddin, to attribute this to her leadership is unjust. The 17th century witnessed intense European expansion in Southeast Asia. The Dutch, in particular, actively tried to smash all Malay involvement in regional trade, bringing many great Malay and Javanese commercial centres, including Johor, Banten and Mataram, under their control. That Aceh maintained its independence in the face of such aggression, while continuing to constitute a major trade centre, is both impressive and a testament to the sultanah’s ability to govern effectively. Moreover, under Sultanah Safiatuddin, Aceh produced a rich legacy of Malay Islamic scholarship that, arguably, has not been equalled since. Far from a failure, therefore, she emerged as one of 17th century Southeast Asia’s most successful rulers. Our final Muslim woman head of state of this region, Cik Siti Wan Kembang, governed Kelantan between 1610 and 1667. A warrior princess who entered battle on horseback accompanied by an army of female horse riders, Cik Siti Wan Kembang ushered in a mini Golden Age during which Kelantan asserted itself internationally, attracting merchants from all over the world and generating a degree of prosperity not seen again for a century. Today, the favourite pet of Cik Siti Wan Kembang, the muntjac (barking deer), appears on Kelantan’s state emblem as a reminder of this glorious past. Although these five ‘Queens’ lived many centuries ago, the longevity of Malay adat has ensured that women continue to contribute to Malay society. While hurdles undoubtedly remain, adat has helped female empowerment progress further and deeper amongst Malays than among other sections of the Muslim ummah.